We are a specialty practice dedicated to providing your pet with the highest quality of internal medicine available. Just as your family physician might refer you to a specialist for a particular problem, your family veterinarian may refer you and your pet to a veterinary specialist. The specialty of small animal internal medicine is broad in scope and focuses on the treatment of numerous organ systems. In human medicine, these same areas would be treated by a wide array of subspecialists, including gastroenterologists, endocrinologists, pulmonologists and urologists. The pet’s disease is uncommon or rare. A neutral second opinion on the pet’s condition is sought. The outcomes of the current treatments are not as expected. To obtain assistance with obtaining a diagnosis or to confirm a diagnosis that has been made. The pet requires a sophisticated diagnostic or therapeutic procedure that is offered by a referral facility. 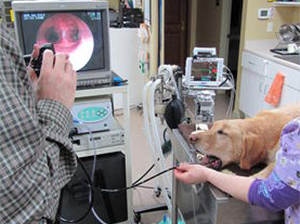 The pet has several disease processes that may benefit from a multi-disciplinary approach. The pet requires 24-hour monitoring.